5K is open to runners 18 years and older who have exhausted their 8 semesters of high school eligibility. Medals will be distributed following each race . On Friday, November 23rd between 4:00 pm and 6:30 pm, registration will be available for early pick-up at the Meet Headquarters. 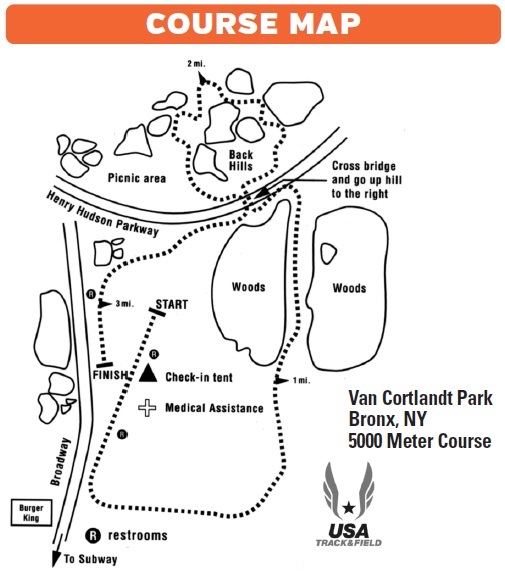 At Van Cortlandt Park (race site) Saturday, November 24th, race numbers will be available at the registration tent beginning at 8:30 a.m. and continuing until the last race. All runners receive a participant New Balance/Foot Locker Cross Country backpack and a meet program by showing their race numbers at the tent. This 5000 meter race is open to runners 18 years and older who have completed high school eligibility. In Open (ages 18-39) and Masters (40+) divisions. High school runners are not allowed in the Open Race. The top 20 male and 20 female runners in each division will receive medals and a New Balance/Foot Locker Cross Country backpack. Every runner in every race will receive a New Balance/Foot Locker Cross Country backpack and a meet program highlighting the previous 39years of Foot Locker races, as well as previewing this year's race. When this page loaded, the official time was 10:39:06 PM EDT.